To the two of you still out there: I'm sorry that it's taken me so long to get to this. I promised it what? two? three weeks ago? 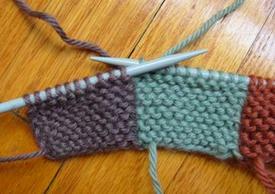 First, if you are wondering what intarsia is: a quick Google search on intarsia knitting will get you started. Also, I've added an archive page with all my blog posts that have mentioned intarsia knitting and show some of the projects I've worked on. That should get you oriented. 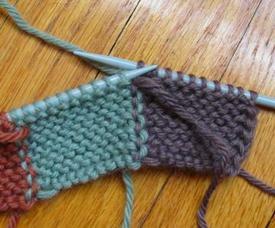 Now, garter intarsia. [Note: for a better look, you can click all the photos in this post to open a window with a bigger view. Also, I've put the rest of the post after the link at the bottom because this is a photo-heavy post]. Here's a swatch I did with three different colors. [Pardon the sloppy cast on]. Here is the back side. This will be the wrong side. Let's go back to the right side and see what happens when it comes time to switch colors. This is sort of a funny picture of the situation. Instead of turning the work around to look at it, this picture is meant to represent what you would see if you held onto you knitting and leaned forward to look at the wrong side. This way, the green stays on the right and the purple on the left. Now, the purple comes up from under the green and there will be no gap between the two colors. OK, I knit to the end of the row and now it's time to come back in the other direction. Once again, I get to the change between the purple and the green. This time, however, things are a little different. If this were stockinette intarsia, the situation would be similar to the changing yarns on the right side of the work: both the strand I was putting down and the strand I was picking up would be on the same side of the work. In that case, I would be purling and both strands would be on the side facing me and I could just twist them as I had on the right side (the knit side). But now, because this is garter, I am knitting on both sides. When it comes time to change, the yarn I am putting down is in the back, but the yarn I want to pick up is in the front. To get them in the correct position, I'm going to have to switch them by first moving the purple yarn between the needles and to the front, and then, moving the green yarn between the needles and to the back. This will lock the purple strand in place and put both the yarns on the correct sides of the needles to continue. See, it's actually pretty easy. I don't know why it took me so long to write it up. I hope at least one of the two of you found this helpful. Neato. I had never really thought about the fact that the yarn would be on the wrong side, but of course I had never tried garter intarsia before. I just flippantly laughed and said "Of course it can be done, what could go wrong?" I'm glad you went through it first and posted helpful hints so I didn't have to eat my words. Thanks, that was helpful. I never would have guessed that the yarn would be on the other side. I'll have to find a progect to try that with. You know what? After reading this, I think I can actually DO it. Thanks. How pretty and so neat and tidy! You're back! Didn't wan't to press you with a "where did you go?" comment. Great tutorial! Fab tutorial ! I have to admit that intarsia is my least favourite type of knitting ! I greatly admire the lovely things you've made. I am struggling with my Weasley sweater and the "R" and after reading your blog the other day concluded that I need to rip out and practice first on a swatch. Thanks for the good info and the great pictures! Wow--that makes so much sense! I never would have thought of it, though. Thanks for the tutorial Michelle. This was really helpful. 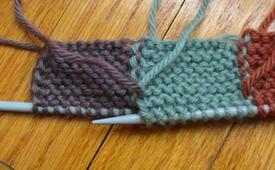 I am knitting a scarf in two colors. The directions call for a 1 by 1 rib. K1,P1 repeat to end of row; P1, k1 rep. to end, and so on. Is this intarsia?? The pattern is in the new R2 book---I've already ripped it out once. I would love your imput. THANK YOU your tutorial helped me tremendously! I really found your tutorial on intarsia knitting great. I'm starting back knitting after a long spell of working & have forgotten a lot! I want to do some pull-overs for our little granddaughter with different motifs on them. I'm doing a teddy bear now and the fairisle way makes the sweater too thick & bunchy carrying all those colors along, so now I will try intarsia! Thank you! Thank you so much! I have been having just that problem- the yarn being on the wrong side when I go to pick it up. This is the first site I've found that explains it! This is the first time I have seen this explained so plainly. It's almost like the people that know how to do this have some kind of secret society and didn't want the rest of us to really know. I love you. I've tried over and over with a piece I've been working on and kept getting "the gap" now I can do it. I've been teaching myself knitting using books....thank you. I agree with everyone - you did a marvelous job of explaining this. I, too, am relearning to knit and am changing colors on teh rows. I see it explained that you put your yarn on "bobbins" so that you don't have large balls dangling (which I am having a terrible time with). WHAT is a bobin? Can I improvise and make one? Do I have to add new yarn often? Thank you so much for your reply. I completely understand how to do it. Thank you so much! WHEN KNITTING ON WRONG SIDE FACING YOU-BRING NEW WORKING YARN OVER DROPPED YARN TOWARD THE RIGHT. GO UNDER DROPPED YARN. BRING DROPPED YARN FROM RIGHT SIDE OF WORK FORWARD TO WRONG SIDE. BEGIN KNITTING NEW COLOR. WHEN KNITTING ON THE RIGHT SIDE FACING YOU: BRING NEW WORKING YARN TOWARD THE RIGHT,GO UNDER THE DROPPED YARN AND OVER THE TOP OF IT TO THE LEFT, AND BEGIN KNITTING NEW COLOR. LEAVE DROPPED YARN ON WRONG SIDE. After suffering through countless instructions in knitting books and Blogs telling you to twist the yarn, or only go in one direction with the yarn when picking up new color, I just paid attention to my hands when it went the correct way, (no other color poking through RS or over twisting), and I WROTE IT DOWN! Michelle's pictures were helpful in determining what the wrong side should look like if you are doing it correctly. One yarn simply catches the other, but when you change from knitting on the right side, to the wrong side the way you pick up and twist the yarn is NOT the same. NO MORE FROGGING FOR ME! I FINALLLY GOT IT! And by the way none of my knitting books, and I have a few ever assume you are doing Intarsia in anything but Stockinette. So what they advised was not helpful. I will be blessed if this helps even one person! Thank you!!! I'm very very ne to knitting and your directions and pictures made great sense! 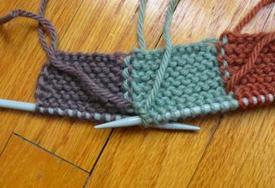 Every other intarsia tutorial seems to assume that I'll be knitting in stockinette, but I almost always knit in garter. This is so damn helpful. How did knitters ever learn before the Internet? 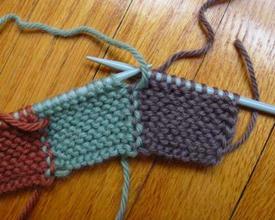 No book told me how to knit intarsia in garter stitch. Thank you! I know you posted this years ago...but it's the only thing online I could find to help me out! Thanks for keeping it up!!! PLEASE NOTE THAT ORDERS ARE FILLED MANUALLY AND THE PATTERN WILL NOT BE SENT AUTOMATICALLY. Please allow up to 24 hours for all orders.